The most common and usual thing we use in our daily life is plastic. Plastics are used to wrap or carry something. Plastics are cheap and long lasting. This qualities made plastic so dangerous.Because after using a plastic peoples throw that in a open ground or in a water source. Because it is a non-degradable thing it not get along with soil. We cannot destroy it because if we burn it causes many harmful gases which is harmful for atmosphere.If we throw it in water it causes water pollution. If we dump it in the ground it causes soil pollution. We can minimize use of plastic by using a poly bag again and again.We should use poly bag made by paper or other things.We can use iron or steal in place of plastic. Some of our e-commerce companies like Flipkart,Amazon,Club Factory etc.uses plastics in a very big range.They should take responsibility that if someone making his own plastics it is his responsibility to recycle or clean it. Government should ban some plastics bags like West Bengal Government. 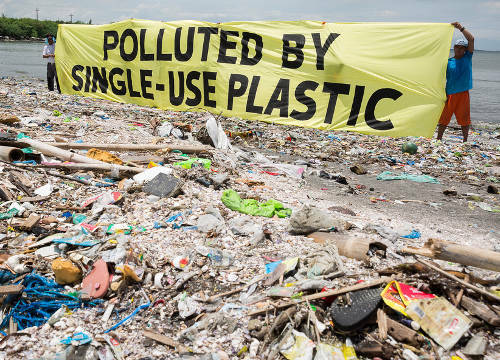 They should make rule that if somebody threw plastics in a open places they have to give fine.Government should ban all the company who are making plastic bags,plastic toys or other plastic item by harmful chemicals plastics illegally. We should clean our society its our responsibility.If government will make a lots of plans and rules but we are not following it when whose fault it is.So we should firstly clean our area and should minimize the plastics bags and plastic garbage.